World-renowned strength coach Mark Rippetoe has the perfect antidote to “functional” training—a barbell. a sport at a higher level because he never had to learn the intimate details as well as the people who tried and never made it. The trying part is when you learn, not the doing-it part. Were Tom Landry or Vince Lombardi great football players? Someone who is very strong can’t get stronger easily. But somebody who’s never trained before can get stronger quickly. A novice hasn’t progressed very far toward their physical potential and can recover from the stress of one workout, or overload event, in 48–72 hours. You’re only a novice for about 6–8 months, then you’re intermediate... For a more advanced athlete, the overload might be a month’s worth of training and it may take that long to adapt and recover from the stress of an overload. the most weight. We don’t balance on Bosu balls with one foot behind us and one in front with 10-pound dumbbells in our hands because that doesn’t cause adaptation to occur. It’s not hard enough. The prowler (a push sled that weight can be added to) is the most useful conditioning tool because it doesn’t have an eccentric component and therefore doesn’t produce an inflammatory soreness response. 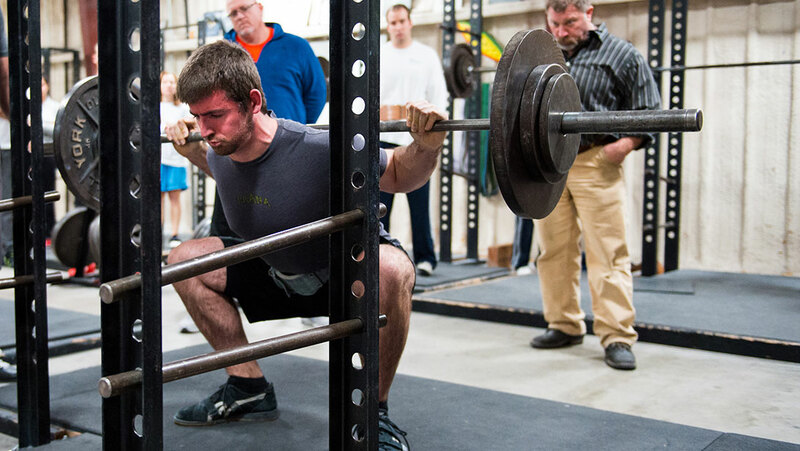 There is no such thing as sport-specific strength training. There should be no attempt made to make strength training look like your sport because that waters down the effectiveness of the exercise. Athletes simply need to acquire strength, then practice on the field with the sport’s movement patterns. Functional training isn’t as effective as barbell training because the loads are too damn light. It’s not done heavily enough to constitute training, and it’s not similar enough to the sport to constitute practice. Functional training is an exercise method that places the balance problem ahead of the force-production problem. To most effectively use your hips in a squat, point your toes out 30 degrees and shove knees out to be parallel with your feet. Look at the floor four feet in front of you and drive vertically with your hips. When setting up for a deadlift, place your feet in a position so the bar is one inch away from your shins. The bar will be directly over the middle of the foot, which is the center of balance for the pull. At the top of the overhead press, shrug your traps upward to lock the bar out. You won’t impinge (cause inflammation) the shoulder in this position.